Collectible or uninteresting? You can be the judge, though not very many figures left Kenner in the wrong packages like these two. This is quite unlike the situation with Galoob's Micro Machines and Just Toys' Bend Ems. 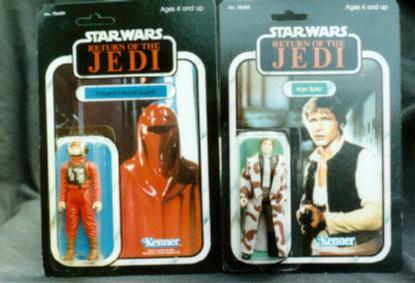 In fact, many of the ROTJ Trilogo figures have been found miscarded where the old Kenner ones generally have not. Both of these were obtained from an ex-Kenner employee so maybe these types of mistakes were truly rare in the marketplace. Other miscarded figures have also popped up but those were from Kenner sources as well. Who knows, maybe Kenner was really on the ball with their quality control.